On April 2, Dr. Zhou Jinfeng, Secretary-General of the China Biodiversity Conservation and Green Development Foundation (CBCGDF), was invited to attend a dinner at the residence of the EU Ambassador. During the dinner, Dr. Zhou briefed Mr. Karmenu Vella, the Fisheries Minister of Environmental and Marine Affairs of the European Union, and Mr. Nicolas Chapuis, Ambassador of the European Union to China, on the work of the CBCGDF. In the 15th Conference of the Parties to the United Nations Convention on Biological Diversity (CBD CoP15), plastic pollution reduction, recycling economy and water policy, which attracted Mr. Karmenu Vella's attention. In addition, Dr. Zhou and Mr. Karmenu Vella exchanged ideas and explored future cooperation mechanisms on the establishment of circular economy legislation in China and cooperation between China and the EU (and its members) in the field of circular economy. 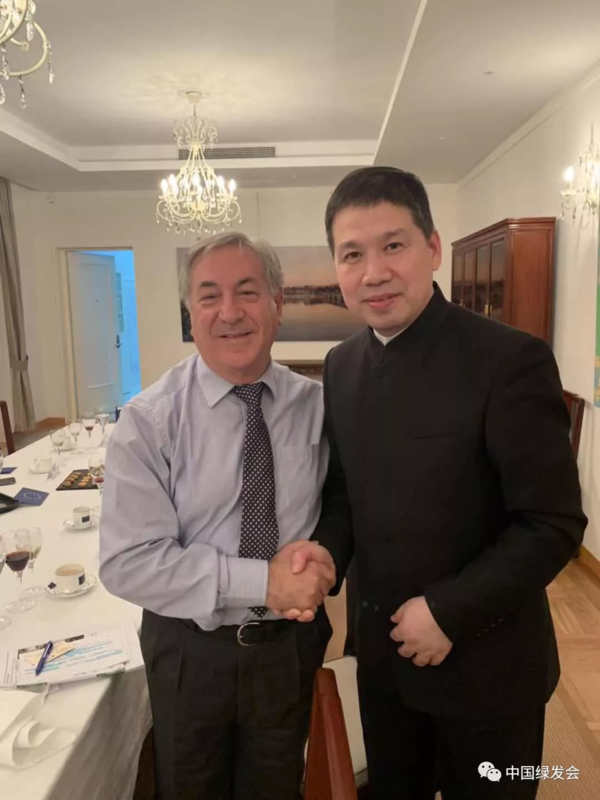 On the morning of this dinner, Mr. Karmenu Vella attended the first meeting of the "China-EU Water Policy Dialogue Mechanism" co-organized by the Ministry of Water Resources of China and the EU Environmental Agency. At the meeting, Mr. Karmenu Vella shared with delegates the achievements of the European Union about water governance, policy and use efficiency improvement. He stressed the advantages and vision of China-EU water governance cooperation. He also expressed that the two sides could achieve mutual benefit through innovative means. The protection and restoration of the aquatic ecosystem is one of the key areas in the construction of ecological civilization. The core of the concept of ecological civilization is to respect nature, comply with nature, protect nature, highlight the harmonious coexistence of human, society, and nature. As General Secretary Xi Jinping clearly pointed out in his speech on water security on March 14, 2014, "Water governance should change from changing nature and conquering nature to adjusting human behavior." Since the report of the 17th National Congress of the Communist Party of China put forward the concept of "ecological civilization", the CBCGDF has studied and discussed what is ecological civilization, why it needs ecological civilization, and how to build ecological civilization. As far as aquatic ecosystem and ecological civilization are concerned, the CBCGDF believes that economic development and people's production and lifestyle should follow the natural law of aquatic ecosystem, protect its biodiversity and water resources, carefully analyze and evaluate projects that may destroy the balance of aquatic ecosystem, and actively carry out the restoration of damaged aquatic ecological environment. For example, in August 2015, the CBCGDF initiated the establishment of a special fund for the protection of drinking water sources in the metropolitan areas. The project "Evaluation of the status of drinking water sources in large and medium-sized cities in the upper reaches of the Yellow River - represented by Lanzhou, Tianshui, and Baoji" was sponsored in 2018. The special fund investigates, analyses and evaluates the current situation of the protection of drinking water sources in Lanzhou, Tianshui, and Baoji. Aiming at the existing problems in the protection of drinking water sources in the three areas, it puts forward improvement suggestions. On March 23 this year, the special fund completed acceptance meeting of the finalization of the project at the Beijing Forestry Society. Experts and principal heads from IUCN China Representative Office, Beijing Forestry Society and College of Soil and Water Conservation, Beijing Forestry University School fully affirmed the research results of the project. Next, the target of the project is to form a model of participation of residents in water conservation areas that can support the scientific and sustainable protection and management of water sources, to provide policy recommendations for improving water source management, and to evaluate the status of drinking water sources in other large and medium-sized cities. In the aspect of aquatic ecosystem restoration, the CBCGDF has also spared no effort. Located in the core area of Sanjiangyuan National Park, the eco-environment has deteriorated rapidly in the Zhuonai Lake basin due to the dam break in 2011. Extreme events, including sandstorms, desertification and the continuous rise of water level in salt lakes downstream, have prompted the CBCGDF to organize scientific research in the Qinghai-Tibet Plateau for many times. "The main purpose of this scientific research is to understand and investigate a series of ecological environment problems caused by the sand-dust storm, the impact of sand-dust on Tibetan antelope and the continuous rise of the water level in the downstream. And we should obtain comprehensive observation data," said Lu Shandong, the head of the scientific research team, Institute of Aerospace Information, Chinese Academy of Sciences. Dr. Zhou pointed out that the trend of warming of the Qinghai-Tibet Plateau under the background of global climate warming was very obvious, the ecological and environmental problems should be studied as soon as possible. This year, the theme of World Wildlife Day 2019 is "Underwater Ecology: For Human and Earth". Underwater ecology and its abundant biological resources provide food and nutrition for human beings and supply 50% of the earth's oxygen. Conservation and sustainable use of underwater resources has become an important issue in the construction of ecological civilization. The CBCGDF Anti-electric Fishing Collaboration Center was established in May 2017. With the aim of "resisting illegal fishing and protecting aquatic organisms", it built a platform for the protection of aquatic organisms and water resources for the national anti-electric fishing volunteers. At present, 8000 volunteers have joined the platform. In Fujian, Zhejiang, Shanghai, Chongqing, Sichuan, Shandong, Hunan, Hubei and Guangdong, 36 volunteer workstations have been set up. More than 6000 cases of illegal electric fishing have been reported. Patrol mileage is more than 120,000 kilometers. To assist local fisheries administration in catching more than 3300 illegal electric fishing criminals, more than 2800 sets of electric fishing equipment and 4700 sets of illegal nets. In March this year, Dr. Zhou introduced the Anti-Electric Fishing Alliance to the Secretary-General of the United Nations Environment Congress when he attended the 4th United Nations Environmental Assembly. Relevant experts attach great importance to the CBCGDF 's "Anti-electric Fishing Alliance": "This is a great experiment of the Chinese people. It has far-reaching significance and should become a typical model for the protection of aquatic organisms and water resources." Public participation in the construction of ecological civilization is the basic idea of green, ecological and sustainable initiatives of the CBCGDF. In the future, the CBCGDF will go all out to further explain the concept of ecological civilization. At the same time, we should mobilize the social strength of all sectors of society and actively promote the cause of ecological civilization construction in China. At yesterday's working meeting, Dr. Zhou put forward the concept of "eco-civilized city planning". Dr. Zhou and Professor Jorgen Randers, author of Limits of Growth, discussed the research of ecological civilization during the meeting of the Executive Committee of the Rome Club from March 30 to 31. During the conversation, Professor Randers mentioned that he had been hired by a Chinese city to guide its eco-civilized city planning. During his work, Professor Randers designed a large artificial intelligence system. We can predict some ecological consequences of the change of variable which may affect the city ecological system. Dr. Zhou attached great importance to this scientific concept of city planning. He immediately invited Professor Randers to join the CBCGDF's Experts Group of Urban Planning on Ecological Civilization and proposed suggestions for the plan of ecological civilization construction. The CBCGDF believes that ecological civilization is a concept of constant change and development. By constantly broadening and innovating its connotation, we truly realize ecological civilization. In the near future, representatives of the CBCGDF will also travel to the Netherlands to communicate with the Circle Economy on the direction of future cooperation, project development, implementation plans, and on-site visits.